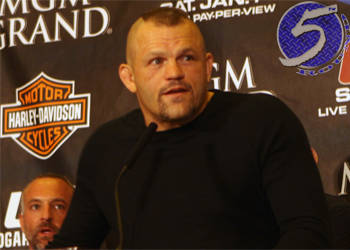 Chuck Liddell (Pictured) officially retired from the sport of mixed martial arts in December of 2010. Judging by the potbelly that he donned in last night’s episode of “Hawaii Five-O,” the former UFC light heavyweight champ has certainly been enjoying his time off. UFC president Dana White previously stated he would never allow his longtime friend to fight inside of his Octagon again. No worries, because ProElite was more than happy to allow “The Iceman” into their cage for Monday’s cameo. This isn’t Liddell’s first time in front of a camera, as he appeared in the movie “Cradle 2 the Grave” in 2003, an episode of HBO’s “Entourage” in 2007 and many others. For the most part, the slugger either played himself or a fighter.